I'm a firm believer that investing time and energy into a considered gift produces far more pleasure in the recipient than anything shop-bought! 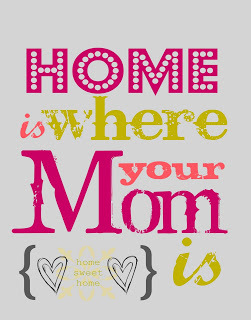 This holds true for Mother's Day in particular: I love to receive the handmade cards and gifts bestowed by my own children, and as an adult I like to create something special with my own hands to gift for Mum. 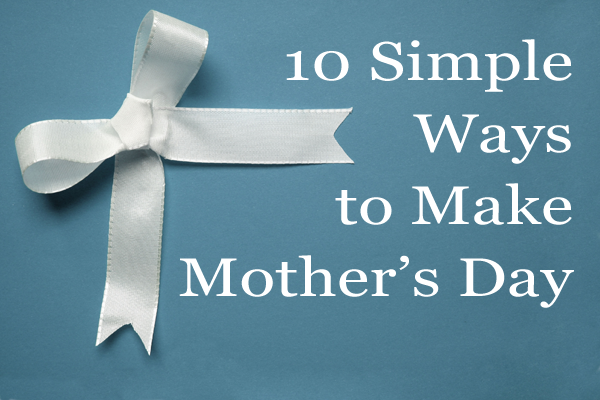 Since there's a good chance Mum reads my blog, I don't want to spoil the surprise of what I'm making this week, but instead will share a selection of beautiful and thoughtful gift ideas you and your children could create as gifts for Mothering Sunday. A pocket-sized photo album provides the perfect gift for Mums and Grandmothers to carry beautiful images of their little darlings (and show off at every opportunity!). 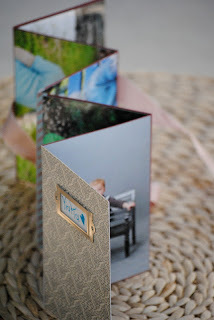 Over at Making Lemonade, Carrie has posted a fantastic photo-tutorial to create this beautiful "brag book" using patterned paper, pretty ribbon and of course a selection of beautiful photographs. These seem very simple to make, yet look stunning and will undoubtedly be cherished by their recipients! Pop on over to Making Lemonade for the full tutorial. 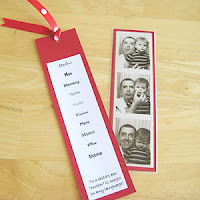 I discovered this lovely idea for a bookmark at Make and Takes - it was created for Mother's day by the author's husband and has since become a treasured gift. You'll need to find an old-fashioned photo booth to do this properly, or you could always cheat using Photoshop and a selection of similar photos! These cute gift sets present an adorable way for mums to have less dishes to wash on their special day! 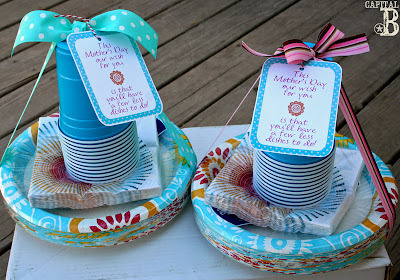 Suggested as gifts for friends and in-laws, they are incredibly simple to put together: just buy a set of cups, plates and napkins in matching schemes, tie with pretty ribbon and add a gift tag! The tutorial (and more lovely photos) is available over at Capital B, along with a free printable gift tag to make your gift set extra-special. 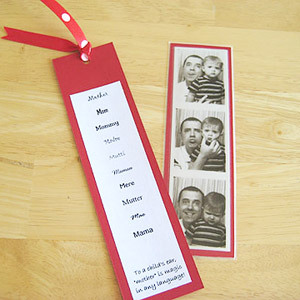 This adorable idea was conceived by Inkablinka who wanted a solution for a gift which can be sent easily by post. Each button is hot-glued to a small magnet and all are stuck to a circular disc inside the plastic packaging. The message on the tag makes the package a very special gift which I'll undoubtedly create for someone special in the near future. 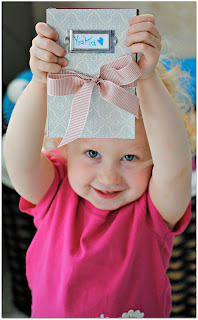 Pop over to Inkablinka's site for the tutorial and links to the printable gift tag. 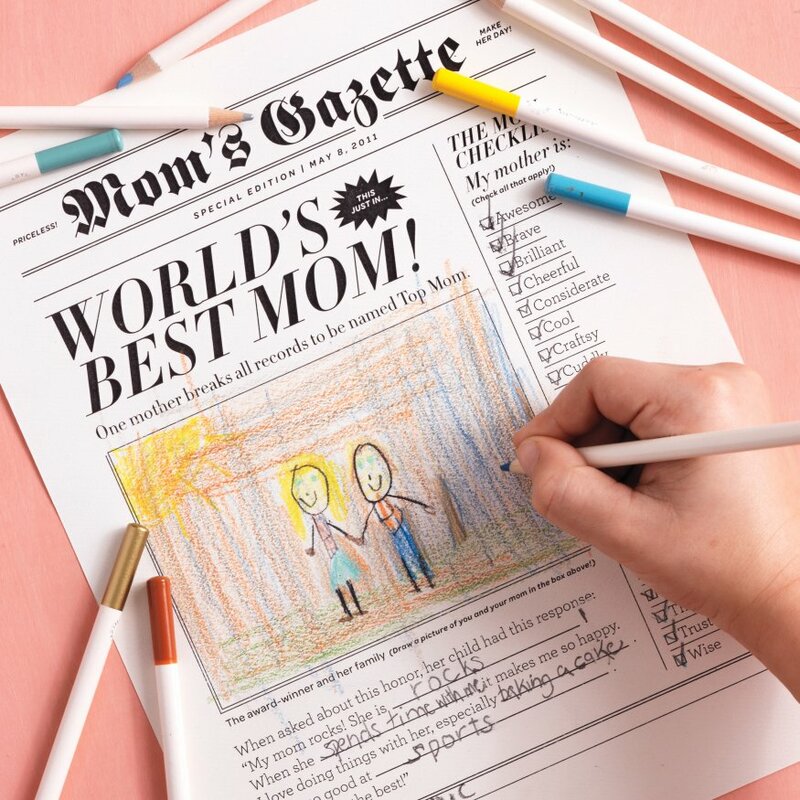 This Mother's Day Newspaper is a gift I would love to receive on Sunday! All you need is a printer and a willing child to fill in the blanks and design a lovely art piece. 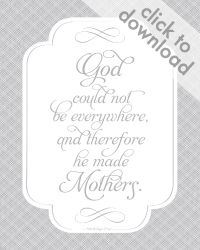 Find the free printable and more details over on Martha Stewart's website. 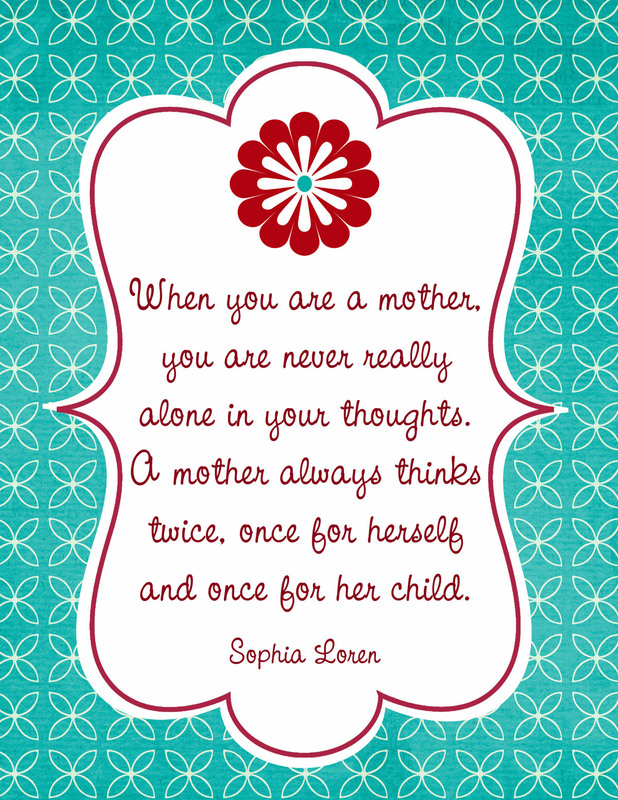 This gorgeous idea was discovered at Better Homes and Gardens. Get your little one to paint a hand-print on sturdy card which can be used as a template to spray the design onto a plain white dish towel. Use fabric paints to write their name and add embellishments to complete this perfect gift for the kitchen. I love this simple greetings card idea from A Day in my Life - it reminds me of the "Guess how much I love you" book (which remains one of my children's favourite bedtime stories). 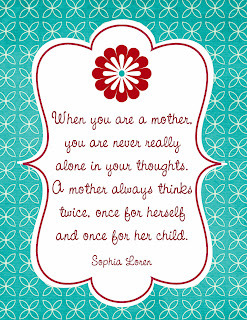 Draw around your children's hands to make it personal and use letter transfers for a professional touch. Find the tutorial and more images over at A Day in my Life. 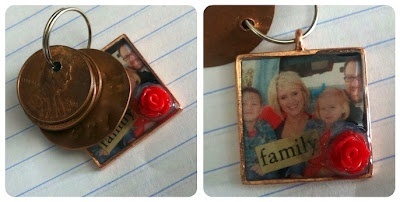 Create a meaningful keychain by finding pennies with memorable dates and drilling holes to attach to a ring. This tutorial originates from The Roseland Family blog, though if you're feeling a bit more adventurous check out this make from The Art of Manliness which uses a similar concept to make a pretty charm bracelet. I saved my favourite craft for last, a beautiful rose made by heating and glueing plastic spoons, which can be finished as a broach, pendent or even as a hair accessory! I discovered this wonderful tutorial via Pinterest and believe the image originated from Duitang.com from the member Dear Yuki. The Tutorial on this site is in Chinese, though a similar English Language alternative can be found over at The Happier Homemaker. 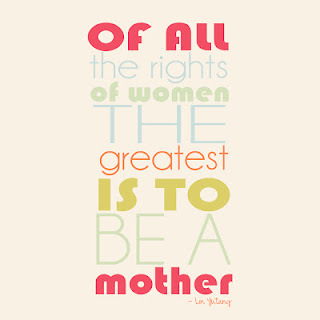 What will you do to "make" Mother's Day? 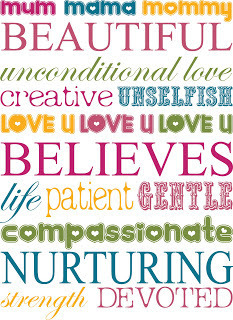 Will you be using any of these ideas to create gifts for a special Mum this Sunday? 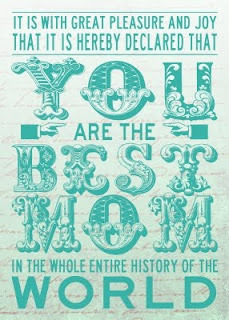 Perhaps you've crafted something original and would like to share it with Glamumous readers? Please feel free to leave your thoughts, comments and suggested crafts by using the form below.